Free white paper: peer-to-peer technology! 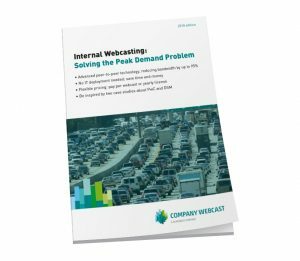 For large companies with thousands of employees and offices across the world, internal webcasting is a serious business – and is also a necessity to keep employees informed, engaged and provide them with training. But webcasts of such magnitude also require serious bandwidth. Webcasts make it possible to reach employees worldwide in an interactive way, which increases the involvement of employees with your organization. But if all employees view a webinar at the same time through the internal network, the internal network can become overloaded if the right tools aren’t used. Peer-to-peer technology makes it possible to broadcast internal webcasts without overloading the internal network or having to compromise on image quality. More information on how peer-to-peer technology allows you to reach employees worldwide via webcasts without overloading the internal network? Download our white paper for FREE. Let yourself be inspired by two cases from PwC and DSM that have already successfully used peer-to-peer technology for internal communication.